"The Newton Historical Commission would like to extend its heartfelt appreciation for your diligent work to champion our recent efforts to strengthen the city's Demolition Delay ordinance. Your persistence throughout the process helped make the difference between success an failure." Lisle was instrumental in achieving the enactment of the second historic district ordinance in Newton, the Chestnut Hill Historic District, and provided important support for the establishment of the next two: Auburdale and Newtonville. 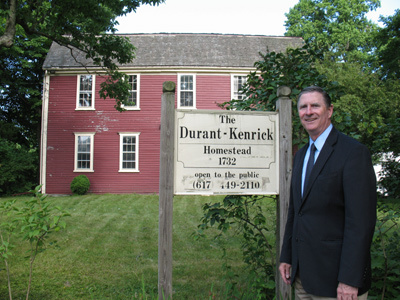 He also provided the leadership to assure the preservation of the Durant Kenrick homestead on Waverley Avenue, an important part of Newton's revolutionary war era history. When its open lot, with its magnificent beech tree, was threatened with sale, Lisle led the effort to preserve it, and the homestead itself. 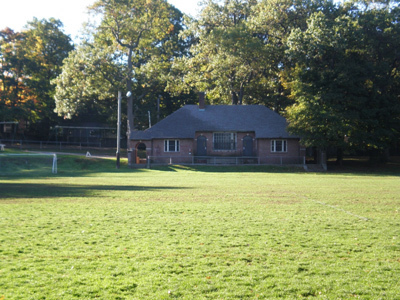 A private fund raising effort successfully matched a City commitment of over $2 million in Community Preservation Act funding (half of which is provided by the state) to help the Newton Historical Society to acquire and restore the Homestead for future generations of Newton citizens, including schoolchildren who can use it to study their early heritage, to enjoy. "Ald. Lisle Baker has been, and is, the creative and driving force behind important land use decisions in our community. He guided the necessary legal and community actions that resulted in the Commonwealth Golf Course becoming a City asset, as well as open space in perpetuity. He responded in an equally dynamic and creative manner to alert the community and the Newton Historical Society to the possibilities of protecting and preserving the Durant-Kenrick Homestead as an educational and historic resource. As our Ward 7 Alderman, and as President of the Newton Board of Aldermen, Ald. Baker has been a thoughtful leader and responsive to issues such as increased energy efficiency in public buildings, zoning challenges, and budget concerns." Burr Park, near the Bigelow School, had fallen into disrepair. Working with neighbors and the City, Lisle helped obtain the funding needed to restore the Park for everyone to enjoy. Houghton Garden is a small gem of open space on Suffolk Road and part of the larger Webster conservation land. Lisle worked with the Newton Conservation Commission and the Chestnut Hill Garden Club to get the Garden restored and a new fence installed around it, as well as parking restrictions to prevent access to it from being pre-empted by commuters from Boston College nearby.